Most participants in this challenge were posting pictures of various types of tea and coffee for today's prompt. But I don't have either of them in cups. I have tea in tall glasses and coffee in mugs. 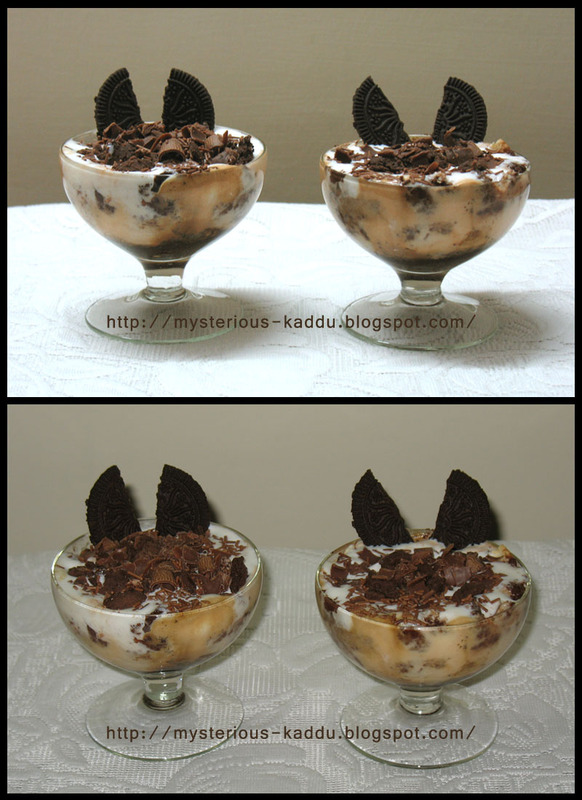 So I decided to showcase my ice cream cups today, with a very amateur attempt at making a chocolate parfait. Originally, I'd planned to make the parfait with layers of my eggless microwave chocolate cake, marie biscuits soaked in coffee solution, and vanilla ice cream. But, I got crazily busy with something else and didn't have any time left to make the cake. So I decided to substitute the cake layer with another layer of biscuits and a second flavor of ice cream. Marie biscuit pieces, soaked in a solution of drinking chocolate powder with water. Vanilla ice cream, topped with some chocolate curls and crumbled chocolate. Also, if you're making this for kids, I would suggest using plain milk instead of coffee solution, for soaking layer 1, because the coffee adds a slightly bitter taste to this dessert. This is my fourth post for 2013 May Photo A Day Challenge. Link to the previous post: "Photo A Day - This is Really Good!" Wow! This posts truly speaks volumes about your commitment! Dad & I just finished dinner too, and I'm still eating my parfait! Arre the things our blogs make us do! @Janu - It is! Try it sometime... it's really easy to make... no cooking involved! I took the top one with flash and the bottom one without flash. Hence no shadow in the bottom pic. And they were so easy to make too, Pixie! Just a different way to present ice cream!